Once, eight long years ago, there existed a time of peace and prosperity in Middle Earth. The free teams of major league baseball – be they Sox of Red or White, Cubs or even Blue Jays – competed amongst one another in harmony, without one team gaining too much power. The Yankees, the most storied franchise in Middle Earth during the First and Second Ages of Baseball (winning 22 championships), lay dormant. Eighteen long years had passed since New York had last claimed baseball’s most covet prize: the World Series Ring. The free peoples of the National and American Leagues believed they had nothing to fear from The Mount that Ruth Built, which lay deep in the heart of the Bronx. But they were, all of them, deceived. The Dark Lord Steinbrenner had lulled the free peoples of Middle Earth to sleep with feigned bouts of incompetence during the 1980s, all the while constructing a grand dynasty in secret. He finally unleashed his evil hordes in 1996, to the ruin of all. Braves (twice), Padres, Mets – all tried to challenge the Dark Lord; yet none were any match for his immense power and bottomless wallet. The baseball world plunged into a time of seemingly-endless darkness. One by one, the free teams of Middle Earth fell to the power of the Ring, but there were some who resisted. The Arizona Diamondbacks, a motley collection of aging ballplayers from the desert who were stout of heart (and strong in pitching), managed to push the Dark Lord’s minions to the brink of elimination in 2001. Yet in Game seven, the battle appeared all-but-over: the Yankees held a one-run lead with their most terrible servant (Mariano Rivera) on the mound. It was in that moment, when all hope had faded, that Luis Gonzalez, star of the Diamondbacks, took up his sword and struck a mighty blow against evil. His World Series-winning single cut the Ring from the hand of the Dark Lord. History became legend, and legend became myth. And for three long years, the Ring remained safely beyond the evil clutches of Steinbrenner. Following the Diamondbacks’ stead, the Angels of Anaheim vanquished the Yankees once again in 2002. It was a strong-armed flamethrower from the southern reaches of Florida (Josh Beckett) that prevented a Yankee triumph in 2003. Meanwhile, the Dark Lord’s lust for his precious Ring grew insatiable. He vowed to spare neither expense nor revenue: the Ring would be his. In 2004, rumor grew of a shadow in the AL East; whispers of a nameless fear spread throughout the baseball world. The Dark Lord Steinbrenner called together his most wicked minions, the terrible Ringwraiths, a collection of nine once noble All-Stars corrupted by greed and hatred. When the Dark Lord succeeded in twisting the fearsome Witch King of A-Rod (Alex Rodriguez) to serve his malicious purposes, the free peoples of Major League Baseball were plunged into a chasm of despair. The Nine have terrorized the American League for the past six months, bludgeoning their payroll-poor opponents to death with a powerful offense and strong bullpen. Even the formidable Twins and Red Sox were no match for Steinbrenner’s minions during the postseason. As you read this, the Dark Lord is ever-so-close to acquiring his prize. The Ring is so near he can feel its presence. Yet hope remains. A last alliance of Cardinals and Astronauts has gathered in the West, poised to once again deny the Dark Lord and his hordes of misguided followers. These valiant races and their leaders (Albert son of Pujols and King Clemens of Texas) will make one last stand upon the slopes of Mount Ruth. The fate of the Ring hangs in the balance. Will the Dark Lord Steinbrenner regain his coveted prize? Or can the army of the National League keep the Shadow at bay for another year? The battle for the pennant is over. The battle for Middle-Earth has just begun. 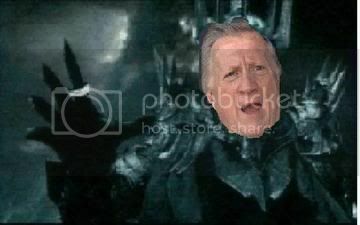 The Dark Lord Steinbrenner has been defeated! Middle Earth, rejoice!